This is an event just for the kids. Kids of all ages up to grade 6 can run/walk/skip the mini miler. Dress up if you want, it’s all for fun! A mile is 1.6km – just right for little legs. This event is not timed but there will be a treat at the end for all participants. Parents are welcome to run/walk alongside their little champs and encourage them along. Starting on the island side of the town bridge, the course crosses the weir, does a circuit of Gilrule Park, turning before the scout hall, before heading back to and crossing the weir again. 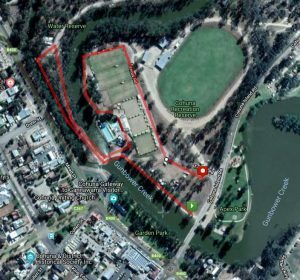 It then turns left to run between the pool and the bowling club, following the track along the creek and around the tennis courts before heading past the front of the bowling club and up to the finish line near the bridge (more specifics of this to come). 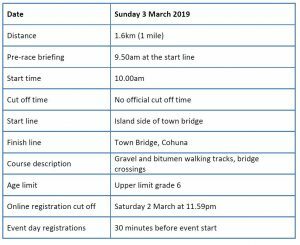 Marshals will be placed along the course and guide runners will run this course to assist with directions. Check out the course you’ll be running! Remember, on event day the roads will be closed so there won’t be any cars to worry about.